Meaning: A writing surface (i.e. papyrus, scroll, parchment, vellum) on which the original inscribed message has been rubbed off and the surface reused. The practice of reusing writing surfaces came into being during the Middle Ages when writing materials were expensive. 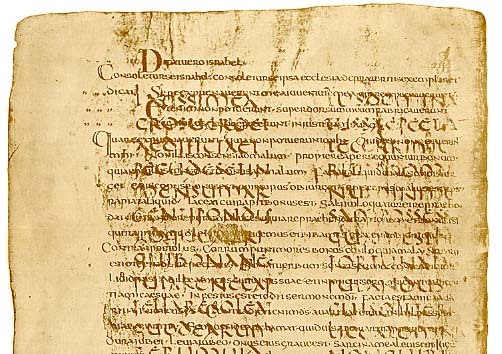 Modern scientists and historians have been able to decipher (and thus reconstruct) many of the underlying or “erased” texts from ancient palimpsests, particularly those inscribed on parchment. One of the most famous palimpsests is the Archimedes Palimpsest on which several treatises (systematic writings on a particular subject) written by Greek mathematician and engineer Archimedes were found on the underlying layer of a Byzantine prayerbook. Definition: The concern and intent to represent things the way they really are without emphasis, embellishment, or ornamentation. In literature, realism is the effort to represent life in great verisimilitude (literally “the appearance of truth”), usually concerning the everyday life of the middle and lower classes. The Realist Movement in Art and Literature: A movement beginning roughly in the mid-19th century which rejected the romanticism that dominated art and literature from roughly 1800-1850. Romantic art and literature was typically very subjective, highly emotional and melodramatic. Realism rejected the principles of romanticism in favor of the depiction of life as is, usually with its focus on the lower and middle classes. Thus, realism generally downplayed plot in favor of an emphasis on character, detail, and the use of everyday language (as opposed to the poetic prose of the romantic era). The realist movement in literature began with French writers such as Gustav Flaubert (L’éducation sentimentale; “Sentimental Education”) and Guy de Maupassant (“La parure”; “The Necklace”). Naturalism: The realist movement spurred the birth of naturalism. Naturalism differs from realism primarily in that it strives for objectivity (the amoral presentation of the world) while realism places a greater emphasis on accurately depicting the world as perceived by the senses. Naturalism also is commonly associated with the issues of social and economic determinism (principle that all events have a cause, dismissing the concept of free will).